There is I think a misconception all be it an understandable one that our twitter account generates a lot of sales. Don’t get me wrong if we are first to mention a reissued Biffy Clyro album on vinyl as happened recently then yes we can sell 40 LPs in 24 hours. If The Twilight Sad or Frightened Rabbit retweet something we have that is hard to find then yes again we will sell what we have but these are the exceptions. Far more likely is we highlight some great stuff and sell nothing at all. Nothing sums this up better than the time Bob Mortimer retweeted my recommendation of two Babybird albums as two of the best albums you would ever hear and both under a fiver. Bob has more than half a million followers. He then followed it up with a second tweet himself saying just how good the albums were. Even I expected a few orders. One person bought both albums ! There was a time when publicising you had the “indies only” version of an album would work but now those times are for the large part gone and were long gone before I closed the shop. “Indies only” is just the starting point. Is it signed ? Does it have a print ? Does it have a signed print ? All these things may be available from the band or their label or a favoured shop and it is what the keen fans are looking for. There may be t-shirt bundles, ticket bundles and then there is the box set invariably now only available from the band or label. For some of the bigger indie labels the “indies only” tag is a convenient way of having a special format they can sell themselves but deny to HMV and Amazon. Fans will receive notice of this “limited” format with no mention it will be in shops and are stampeded towards buying to make sure they secure a copy. Some labels may limit their sales but often add an extra not available in shops. Regularly though labels now sell more than all the shops combined. This is simply an arena I am happy to exit from to hopefully take on the much harder but more rewarding task of creating new listeners who may in time become fans. Should I have needed reassuring at all then the new Teenage Fanclub album has convinced me of my decision. Avalanche has sold thousands of Teenage Fanclub albums over the years. More than a thousand of “Bandwagonesque” alone. With all the excitement surrounding the new album we were often tagged with news and our tweet with the Uncut guide to all their albums reached many thousands of people along with our album pre-sell. The previously unseen footage from Other Music in New York was incredibly popular. So how many of that indies only clear vinyl were ordered ? NONE ! Don’t get me wrong here I’m not complaining just making it very clear that there is no guaranteed connection between social media and sales. Postings were popular on facebook too. Teenage Fanclub are deservedly held in great affection by those of us of a certain age and those fans would often understandably like a signed copy. 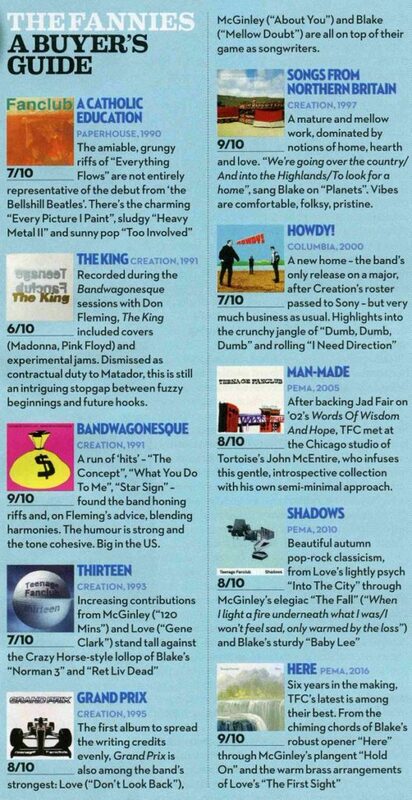 For Teenage Fanclub you could read King Creosote (over 10,000 albums sold) and don’t even get me started on The Wedding Present or I’ll tell you the story of how I put them on the Friday before “George Best” came out after they were double booked with The Triffids and got bumped. Luckily I had offered to curate a gig at Potterrow and they played for £300. Divine Comedy sold 399 copies of their new album in independents one twelfth of the copies sold by HMV, Amazon and most importantly the band themselves. This is not just an Avalanche problem. I do have a Divine Comedy / Belle and Sebastian story for another time ! I’m sure many of those same middle-aged Fanclub fans will head the queue to support the History of Scottish Music Centre so karma will be restored and all will be well.